March 20, 2013, part 1 of 1. In today's show we are joined by Josh Jackson to discuss highly controversial media reforms proposed by the Minister for Communications, Stephen Conroy. We also take a look at the implications of the Cyprian crisis for internatinal banking, and the alternate non-centralised currency bitcoin. February 28, 2013, part 1 of 2. February 28, 2013, part 2 of 2. 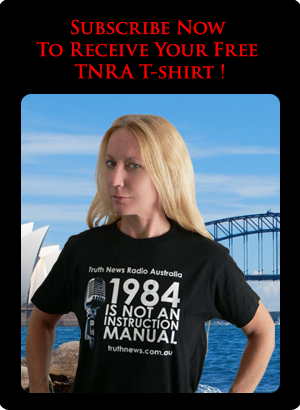 Thugs have threatened to shut down TNRA - we must be doing something right! These threats are of course pathetic and indicative of a major chip on the shoulder. I doubt the author is even capable of "walking the talk", but I'm flattered nonetheless that he thinks TNRA is important enough to warrant such an attack. These threats are purportedly coming as a result of my sceptical position on chemtrails, believe it or not! The fact that chemtrailers are willing to entertain the idea of using violence against TNRA should indicate to you that there is something amiss with the whole chemtrails movement. This clip is from the film "Hitler: The Rise of Evil". It is often said, "all that is necessary for evil to triumph is for good men to do nothing". As a follow up, we might add: "History seldom repeats, but it often rhymes". Once again, freedom is under threat. Evil is rising.